Glossy colour portraits and action shots of the players with biogs and stats on the verso. I will not split this lot for individual cards. However, I do have quite a few 'doubles'. The cards are in very fine condition, glossy and clean with sharp edges. THIS CARD IS FROM2013-14 FLEER RETRO '00-01 FLEER AUTOGRAPHICS. THIS CARD IS FROM2011-12 FLEER RETRO AUTOGRAPHS. 35 FLEER ULTRA 1996-1997 - ALL IN EXCELLENT CONDITION. Fleer NBA (Basketball) 1994-95 Trading Cards (plus a few 95-96). Pippen, Shaq, Rodman. Condition see pics. Make: Fleer. Single Card As Seen In Scan. Super rare Jason Kapono rookie card, only 25 made. 03/04 Fleer Skybox Rookie RC. Slight machine indentation on its surface likely due to being the first one made. 03/04 Fleer Skybox Rookie RC. Super rare Brian Cook rookie card, only 25 made. Serial numbered 012/025. 03/04 Fleer Skybox Rookie RC. Super rare Troy Bell rookie card, only 25 made. Serial numbered 015/025. This lot consists of 8x Phoenix Suns. Lot of used Fleer NBA cards. Super rare Zoran Planinic rookie card, only 25 made. Serial numbered 013/025. 03/04 Fleer Skybox Rookie RC. 13 Scottie pippen trading cards. Make: Fleer. Year : 1994. Individual/Single Card. Fleer 1994 - 1995 #13 blue Edwards Bostos Celtics basketball-NBA card. as shown on the image. 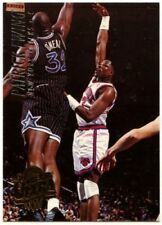 Fleer 1994 - 1995 Basketball NBA Card #211 J. R.
Fleer 1994 - 1995 Basketball NBA Card #73 Victor. as shown on the image. 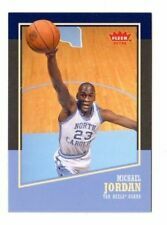 Fleer 1994 - 1995 Basketball NBA Card #181 a. C.
Fleer 1994 - 1995 basketball NBA card #181 A.C. Green. as shown on the image. Make: Fleer. Size Approx. : 64 mm X 90 mm. Single Card As Seen In Scan. Fleer 1994 - 1995 Basketball NBA Card #176 B. J.
Fleer 1994 - 1995 basketball NBA card #176 B.J. Tyler. as shown on the image. are Boosterfrisch - blank. 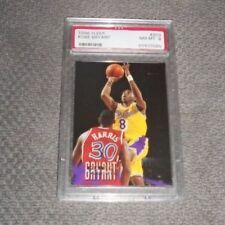 1996-97 FLEER Z-FORCE KOBE BRYANT BASKETBALL CARD ROOKIE CARD RARE MISPRINT!